Storybook season comes to abrupt close as team suffers three-game skid. The scoreboard reads, “Woodward 50, Grady 49.” Seconds remain for the Grady boys basketball team to clinch a spot in the state playoffs. As the clock ticks down, senior Greg Sessions dishes the ball to junior Chad Winfrey. Winfrey goes up for a 3-pointer that swishes through the hoop as the buzzer goes off. Grady wins 52-50—putting them one step closer to a state title. The win against Woodward Academy was the team’s 22nd win of the season and 11th in a row. Head coach Douglas Slade remembers that game as the most exciting of the season. The team’s winning streak came to an end the next day when the Knights lost to Towers High School in the semifinals of the region tournament. With this loss the boys’ hopes of playing for a region championship and the chance to secure home-court advantage for the first round of the playoffs were gone. The team now had to play a consolation game for third or fourth place against Washington High School. Despite beating Washington twice in the regular season, Grady lost 82-75. Both Slade and Taylor were frustrated with the outcome. Taylor was especially discouraged because he felt like some of the players gave up on the game early in the fourth quarter. Despite being a No. 1 seed in the tournament after winning division A with a 21-2 regular-season record, the team came out of the region tournament ranked fourth. The team headed to Carrollton County for the first round of the playoffs to play the region 6-AAA champion Carrollton Trojans. Slade knew Carrollton was going to be an outstanding team but believed that if his team played to their potential, they would win the ball game. After building a first-quarter lead and trailing by only four at halftime, the team faltered late and fell 70-57. That game ended one of Grady’s most successful boys basketball seasons. The team started the season with high hopes of competing for a state title. With the core of the team returning and having only lost three seniors from the year before, Slade and the players believed they could win a state championship. The team started off the season with nine wins in a row. “I knew we were going to be good when the season started because we had a pretty good season last year, but I definitely saw improvement through the year,” junior center Cory Caswell said. Slade and the team credit their successful season to team chemistry. Caswell said the team had a better attitude than last year. He thinks Slade is the reason they got better and closer this season. Despite this season’s disappointing finish, the team has high hopes for next year. 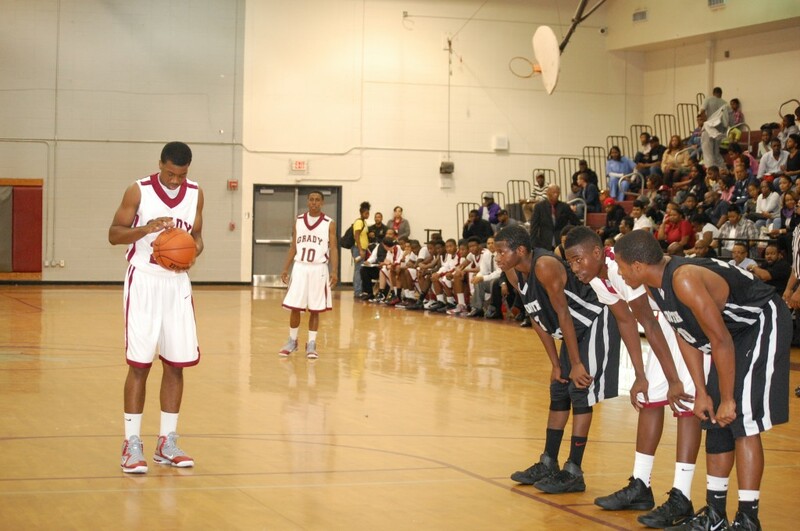 ANTICIPATION: Senior Gregory Sessions prepares to take a free throw during the Grady vs. North Atlanta basketball game.